For the past two years, Goldilocks Foundation and Caritas Manila have been working hand-in-hand to help several communities around the country with their Integrated Nutrition Program. The Program aims to help alleviate the problem of severe malnutrition in children, especially in poor communities. The program began in May 2017 and has since grown to a stable outreach that has rehabilitated and improved the lives of hundreds of children. The program lasts 120 days and distributes Vitabread, necessary vitamins and supplements, as well as other donated food items to children, making sure to improve their health and nutrition. Not only that, Goldilocks Foundation and Caritas Manila provides the children's families with a Family Development session that focuses on health, nutrition, and livelihood. They also conduct seminars on proper personal hygiene, health tips and other related content so that their community beneficiaries understand the basics of combating malnutrition and protect their children's health. Medical assistance is also provided for free during the entire program. 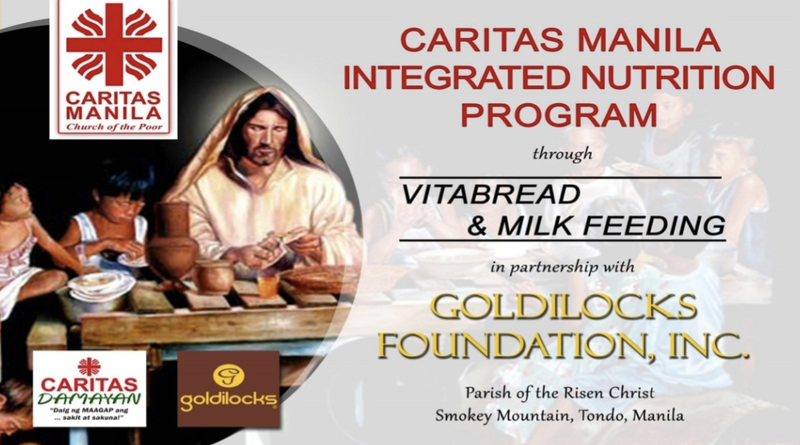 The Vitabread feeding program recently ended their second phase, and Goldilocks and Caritas Manila are proud to announce that they have increased their beneficiaries in the communities of the Risen Christ Parish and Our Lady of Peace and Good Voyage Parish, both in Manila. When they started two years ago, they only had over 200 beneficiaries. At the end of their second year, they had a total of 618. The program aims to be able to help even more in the coming years. Malnutrition is a growing problem here in the Philippines. According to the latest survey from the Food and Nutrition Research Institute of the DOST, 31.2% of Filipino children aged 5 to 10 are underweight and malnourished. The 2016 Global Nutrition Report backs this up, ranking the Philippines as one of the countries with the highest number of underweight and severely malnourished children. The Integrated Nutrition Program of Goldilocks Foundation and Caritas Manila is a step forward in helping Filipino children to become healthier and stronger. Be healthy with Maxicare Veggie Festival! What you'll get with Watsons Card? Marc Nelson Landlite's newest brand ambassador! Latest advanced appliances from Toshiba!